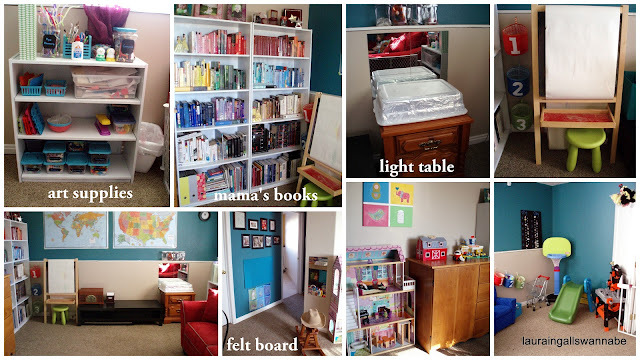 the journals of a Laura Ingalls wannabe: Brand Spanking New Playroom! 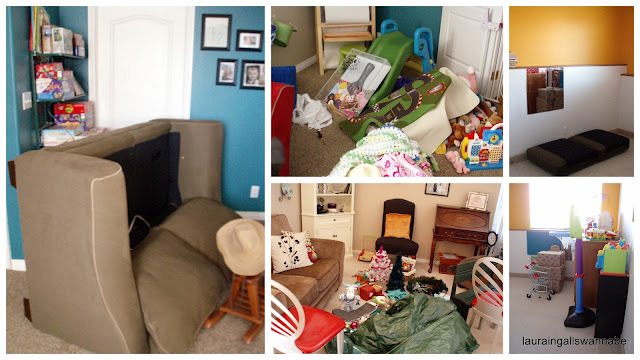 On New Years Day, I was struck with the wild urge to rearrange a few rooms in our house. 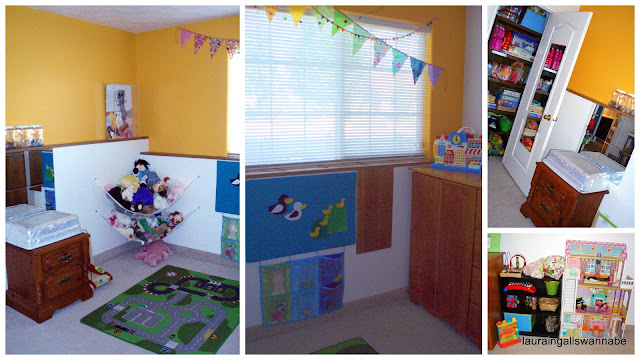 We started with a large family room that held a couple couches, the TV, the grownups' bookshelves, and a few toys, and a small playroom that held the rest of the toys and had a few designated play centers set up in it (felt board, light table, dress-up wardrobe, etc.). We don't watch much TV, and we do a heck of a lot of playing, so it seemed silly that the largest room in the house was dedicated to the former and the smallest room in the house the latter. I also decided I wanted to move Meg's indoor art supplies downstairs. They were formerly in the kitchen, which worked well, but I wanted to use the bookshelf they were living on to house toys both kids can play with while dinner is being prepared. I figured the now-obsolete TV stand would be the perfect place for Meg to work on art projects when it's too cold to use our garage art studio. Now, because this was New Years Day, all the Christmas decorations were still scattered around the house, the kitchen was a mess from holiday baking and entertaining, and I was home alone with the kids. Perfect time to try moving large pieces of furniture, no? So I, uh, managed to get the couch wedged into the hallway and couldn't get it any further. When my husband got home, it actually took the two of us lifting and shoving as hard as we could, and also temporarily removing a doorknob, to get it into the right room. It only took a few days to get everything in place after that. There are still a few aesthetic changes I'd like to make. I want to hang two more matching clocks under the black one pictured and set them to different time zones (probably pacific and central where our extended families live). I have a wire and clips to hang above the art table for Meg to display her work. We need to install a chair rail around the perimeter of the room. I've found some cool maps of Middle Earth, Jurassic Park, Neverland, and Narnia that I think would be fun additions to our US and world maps. But for now everything functions. 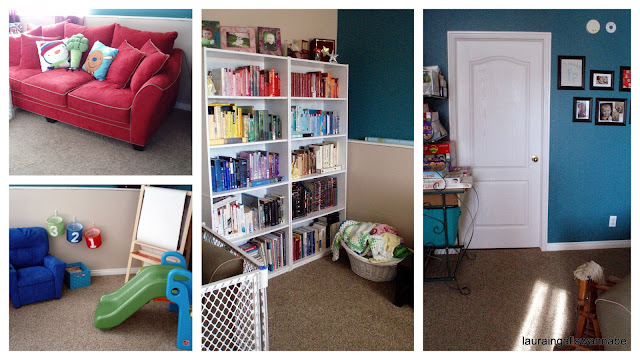 The kids love all the space to spread out, and my husband and I love that the TV is no longer the main focus of the room. The old Ikea TV stand is the perfect height for Meg to kneel or sit at and create. Her art supplies are handy. Homemade light table and transparent materials in jars and drawers. This whole area can easily be sectioned off with the Superyard so Meg can play with tiny-pieced toys without fear of the baby swallowing any. Record/CD player and our favorite CDs. Easel and buckets of chalk, dry erase markers, and colored pencils. Doll houses (the giant one was a pristine handmedown from a family friend) and dress-up wardrobe. Holy Moly this is AWESOME!!! You are an inspiration. I hope you felt like supermom when it was totally complete! Kristen, I just saw your comment and it made my night. Thank you!